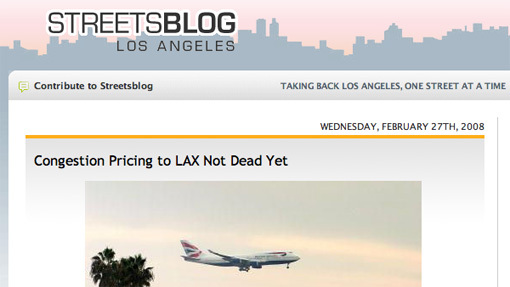 Streetsblog Los Angeles, which isn’t an unknown entity, has been offering insightful info on transportation, sustainability and everything-in-between-related issues to Southern Californians since 2008. They were one of the foremost online blogs to tell the world about CicLAvia, they reported on my friend and fellow former EHNC governing board member Ed Magos’ fateful bicycle accident last year (I saw him at CicLAvia on Sunday, riding on his bike and he’s doing great nowadays), which was perhaps the main reason why the motorist who hit Magos turned herself in and was charged. Far from just a blog (elsongeles is “just a blog”), its a reputable news source read by policymakers and the general population alike. Even the Mayor of Los Angeles wrote a post recently. Tonight from 6 to 10 p.m., Streetsblog is throwing a fundraiser party at Los Angeles Eco-Village near Koreatown to ensure it keeps going and informing the public. A $20 sliding-scale donation gets you in with an evening of food and drink (Sponsored by Trader Joes and New Belgium Brewing), a silent auction, a CicLAvia film screening, the company of cool people and live music from Telematique (an electronic string duo consisting of my friends Somerset and Aurisha Smolarski Waters – BTW, did you know Somerset and I coined the name “Hel-Mel” in November 2005?) and…yours truly, doing a solo set on acoustic guitar and keyboard, playing some acoustic soul music. Most people there don’t even know that I’m also a singer/musician, so this will be an interesting opportunity to see my music and community worlds intersect again. Usually good things come out of those kinds of situations! I was selected to be a member of the host committee, which consists of a whos-who of folks active in the transit/environment/sustainability/cycling communities. So as one of the hosts (if you’re reading this), this is my personal invite to you — do try to come out and show some support for Streetsblog! For more information on the event, click here. You can also RSVP on the event’s Facebook page. 1 comment to Show Some Support for Streetsblog Tonight!